The Blog New to Cloth Nappies? Start Here! Welcome to the wonderful world of cloth nappies! Want to use cloth nappies on your baby? Here’s a summary of everything you need to know to get started – in ‘easy to understand’ terms! The world of modern cloth diapering is full of complicated terms and nappy types, but we thought of picking out the important stuff for you. There are many different types of nappies on the market. In summary, the different types for you to consider is daytime nappies, night time nappies and newborn nappies. So let’s break is down. Daytime cloth nappies are designed to be trim and pretty. While you do get sized nappies, most on the market are one-size-fits-most, and generally fit babies around 5-15kgs. Daytime nappies need to be changed every 2-3 hours. While mommies that use disposables may argue that this is a lot of changing, it is generally advised that ALL types of nappies be changed often for hygiene reasons, regardless of how full the nappy is. Most daytime cloth nappies consist of absorbent inners and a waterproof outer piece that are either snapped or sewn together. Night time nappies are designed to be very absorbent, and should last through the night, or for the duration of baby’s night time sleep. Because these nappies need more absorbency, they are not as trim as daytime nappies. These nappies are generally made of a fully absorbent material throughout the entire nappy for max absorption and are called fitted nappies. Most night time nappies require a separate waterproof cover to be worn over the fitted nappy. We recommend using a Softshell Fleece Waterproof Cover. These covers are gentle and very breathable. Many cloth nappy companies will claim that their one-size-fits-most (OSFM) nappies are suitable from birth to potty training. This is not really accurate as OSFM nappies are simply too big to fit a newborn bum properly. Newborn nappies can be used for the first few months until your baby is big enough to fit into OSFM nappies. As newborns are changed very frequently, we don’t really differentiate between day and night time cloth nappies. We have found newborn fitted nappies with waterproof covers to be the preferred choice, because they are easy to use, adjustable, absorbent, and suitable for both day and night. Used nappies are kept in a dry bucket or large waterproof bag (called a wetbag). You do not soak modern cloth nappies as this can damage the special waterproof fabric and elastics. Daytime nappies can be put away for washing straight after a change, but night nappies should be rinsed and wrung out before putting them in the bucket as they absorb a LOT of wee during the night and rinsing will prevent smells. Once you have enough dirty nappies, you simply put the whole kaboodle in the washing machine. You end up washing every two to three days. If you are out and about, you simply carry a small wetbag with you. Used nappies can be kept in the wetbag until you get home. Wetbags keep the smell and moisture perfectly contained. What about the poopy nappies you may ask? All poop needs to be disposed of in the toilet. (Fun fact: most disposable brands also recommend that you do this, as we are not supposed to send human waste into our landfills, so it really is a basic hygiene necessity whether you use cloth or disposables). You can use disposable bamboo liners to catch the poop and then pop it in the toilet. This generally works well but the liner will not be able to contain runny poo so this is not a totally fail proof solution. I personally do not use liners and rather chose to invest in a good bidet sprayer. This is a sprayer attachment you connect to your toilet. A soiled nappy can then just be sprayed clean in the toilet and put away with the rest of the nappies, ready for wash day – easy! Once your nappies are in the machine you need to run a rinse cycle. This will rinse out all the wee and prevent washing them in wee water. Next you need to put the nappies through a long cotton cycle. We recommend that you wash your nappies at a cool temperature up to 40℃. Anything hotter than this may cause damage to your nappies in the long run. Cold washes are also perfectly fine. You need to stay away from bleach, as this can damage your nappies. Once your nappies are clean, you simply hang them up to dry. We recommend that waterproof covers be dried out of direct sunlight as this may damage the waterproofing over time. The rest is all good to bake in the sun. (Fun fact, the sun is great for bleaching out stubborn stains!) We try to stay away from tumble drying but if you need to tumble dry occasionally, do so on a low heat. Poor fit is the first reason. Modern cloth is wonderfully adjustable, you just need to find the right setting on your baby every step of their development and growth. A well fitting nappy should be snug but not too tight. There should be no leg gaps. A well fitting modern cloth nappy is great at keeping those runny poops contained – much more so than disposable nappies! Not enough absorbency is the second reason. As our babies get older, so their output increases. A nappy that was once adequate may need extra boosting as your baby gets older. Thankfully there are lots of options on the market, you simply add an extra few layers and baby is good to go. Be sure to use cloth safe detergent. Most commercial detergents are effective as long as they do not contain softeners. Fabric softener should not be used as it causes a build-up on your nappies, making them less effective. Moms who use cloth nappies say they experience fewer rashes. We have definitely found this to be true, and it’s no wonder, your baby’s skin isn’t exposed to the harmful chemical cocktail found disposables. You do not need to use bum cream if you cloth diaper your baby. In fact, you should not use conventional bum cream as this can cause a build-up on your nappies and make them less effective. If you need to use something we recommend natural products such as coconut oil or a cloth-safe cream. Try invest in good quality. Super cheap nappies are often poor quality, don’t come with adequate absorbency and you end up spending on boosting them or replacing them frequently. One of the many reasons we cloth diaper is to reduce our carbon footprint and the ethics behind the products we use. 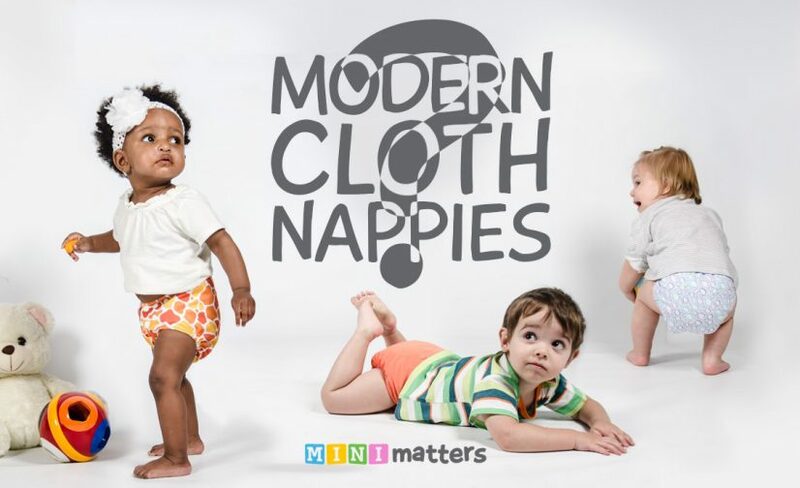 Mini Matters nappies are 100% locally made, from design to fabric and manufacture. We are very proud to be the only brand in SA that have true bragging rights to this. While it may seem that cloth nappies are a big initial outlay financially, you will find huge savings in the long term once you start to do the math. Consider that good quality nappies can be used on more than one child and there is a robust second hand market for cloth too, so once you are done with them they can be sold on. Daytime nappies. 24 Is a good number if you want to do full time cloth, but you don’t need to start all out. Invest in a few every month and you will have what you need in no time. Night time nappies and covers. 3-4 is a good number to have depending how often you want to do laundry. Consider that night nappies do take a little longer to dry. Want to try our nappies or get advice from fellow moms? Join our Facebook group In the pinned post you will find a 15% off coupon code to use on your first nappy purchase! Have any other burning questions about getting started with cloth diapering your baby? Send us a mail to hello@minimatters.co.za or Whatsapp 078 273 8155. We’d be happy to help! Good day, I am interested in your new cloth nappies, is it possible to buy only one to try them out and if so how do I go about ordering. My grandson was born premature and weighs 3.03kg. Hi Gail, you are welcome to buy only one to try first. Are you looking for newborn or one-size-fits-most nappies? You can order on our onlne store, just click on the shop tab, but if you need help ordering please get in touch.